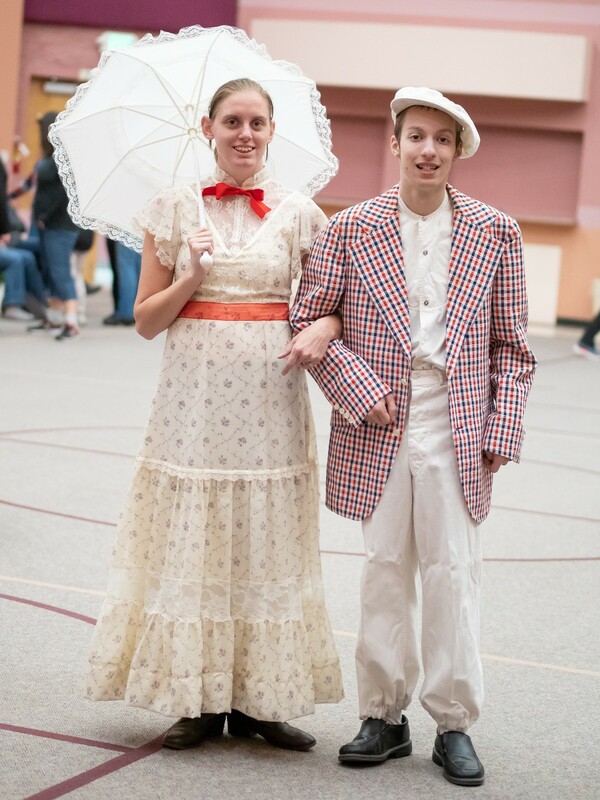 Actors Sadie Fischer and Logan Basta, playing Mary Poppins and Bert in the upcoming Out of the Shadows Theater production of Mary Poppins Jr., pose for a photo. For years, when local actress Wendy Carroll would audition or perform in a production, her son Toby would be right there with her, going to practices, bringing water to actors backstage, even helping clean the lobby. But one time a few years ago, as she saw him in the audience watching an audition, it struck her that he was sitting there thinking, "When is it my turn?" Toby, now 28, has several disabilities, including a developmental disability, cerebral palsy, and epilepsy, Carroll says. "It was very emotional for me," she says. "I knew I had to do something to fix that, because he would never have a turn." So she set to work with no budget to speak of, gathering support in the local theater community to put on a brand new kind of production, one in which all the actors have special needs and are supported on stage by shadow actors. Out of the Shadows Theater was born. Each year, for a few months leading up to November, the actors practice in Coeur d'Alene with their shadows, actors who serve as props on stage with them during the production, offering a nudge in the right direction as needed or whispering a forgotten line. But the participants are truly the stars, Carroll says. "It’s the most joyful theater experience I’ve had in all my years," she says. "The theater company’s intention is to create a show to please the audience, and that's a good thing. But our intention is to please our actors. 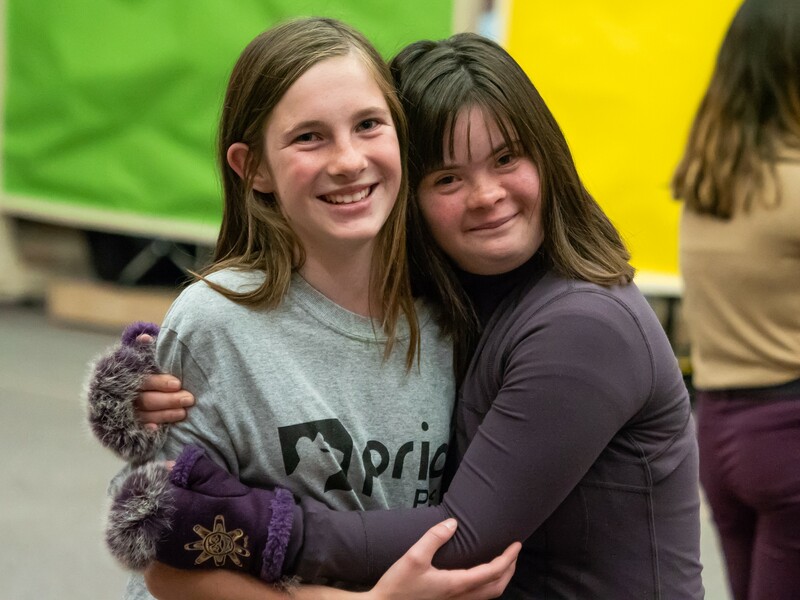 We want them to have a joyful, wonderful experience exploring theater." The result has been astounding, Carroll says. Their first production in 2016, Beauty and the Beast, sold out, with all 400 seats full at the Salvation Army's Coeur d'Alene Kroc Center. People had to be turned away at the door, and the same thing happened the next night. So in 2017, they added a third performance. That too, sold out. "People are responding to it, they love it," Carroll says. This year, the all-volunteer group will again put on a show for three nights, with a production of Mary Poppins Jr. running Nov. 2, 3 and 4 at the Kroc Center theater, 1765 W. Golf Course Rd., Coeur d'Alene. As previous years have sold out, the group recommends buying tickets early if you want to go. They can be found at kroccda.com/tickets. Working as a producer and helping build up Out of the Shadows has been incredibly rewarding, Carroll says. Actors who are participating in an upcoming Out of the Shadows Theater production of Mary Poppins Jr. pose for a photo"
The actors range in age, with most between about 20 and 40 years old, but there've been some as young as 10 and as old as 67, with the breakdown of ages about the same for the shadow actors. "We have a lot of shadow actors who’ve never ever worked with anybody with special needs before," Carroll says. "The bond that’s created between them is just amazing." Oftentimes the friendship will carry over after the few months of rehearsal that lead up to every November performance: Sometimes they'll catch up over coffee or call each other, and quite a few have continued to work together in subsequent productions, she says. One of the most unique experiences Carroll says she's ever felt during her entire time working in theater is how the audience responds when an actor forgets their line or pauses as they're remembering what to do next during a show. "You can feel 400 people leaning forward in their seats going, 'Come on! You can do it!'" Carroll says. "It's the most phenomenal sensation I’ve ever felt, when an entire audience is rooting for the actor." But above all, Carroll says, the most beautiful thing to witness has been the transformation for the actors, many of whom have never been given the chance to participate in the arts in this way. By the time performances roll around, some of the actors have challenged themselves to do things that amaze their families. One actress who'd worn noise-cancelling headphones for years decided she was OK not wearing them by the time of the performance, Carroll says, though if she had needed, the braids on her wig could have concealed them. Her favorite story involves another actress who was in a wheelchair and needed surgeries and therapy for mobility. She was provided a costume that could go over her wheelchair, Carroll says, but the actress was determined to walk instead, and by the time of the show, she was doing so with a walker. "Her parents said she’d been in therapy, but wasn't pursuing it that much," Carroll says. "But once she had a deadline to be on stage, she made it her goal." Looking ahead, Carroll hopes to be able to offer even more arts experiences for people with special needs under the umbrella of newly-formed 501(c)(3) Celebrate Inc., which includes Out of the Shadows Theater. "We have big plans for the future for other programs involving fine arts," she says. "We’d like to see classes available for the disabled on oil painting, sculpting, weaving, drawing, any kind of fine art program." And of course, the theater productions will continue. Next year, the group plans to build on their success and perform over two weekends. More than anything, Carroll says she'd like to see similar programs expand into every community, because as far as she knows, this is the only theater production of its kind in the Pacific Northwest, and one of maybe 15 similar groups in the country. "I’d like to see these in every community, everywhere," Carroll says. "Heck, somebody could do one in Spokane and I’d be there to help them. I’m all about expanding this program."